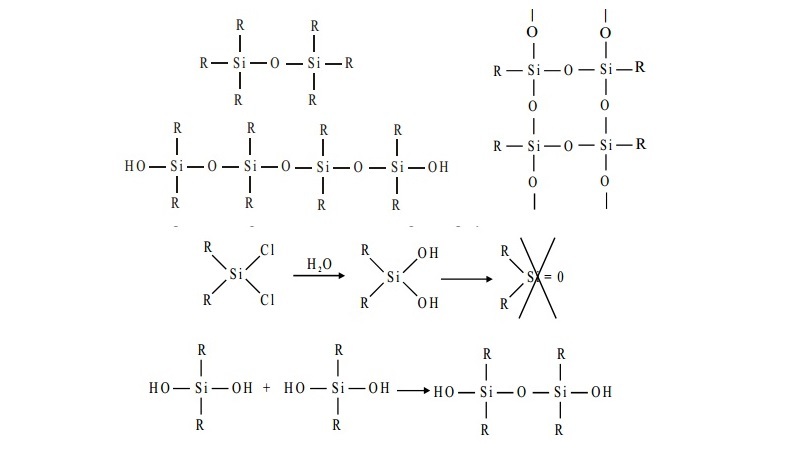 The silicones are a group of organosilicon polymers. They have a wide variety of commercial uses. The complete hydrolysis of SiCl4 yields silica SiO2, which has a very stable three-dimensional structure. The fundamental research of F.S. Kipping on the hydrolysis of alkyl-substituted chlorosilanes led, not to the expected silicon compound analogous to a ketone, but to long-chain polymers called silicones. The starting materials for the manufacture of silicones are alkyl-substituted chlorosilanes. Thus the hydrolysis of trialkylmonochlorosilane R3SiCl yields hexa- alkylsiloxane. The dialkyldichlorosilane R2SiCl2 on hydrolysis gives rise to straight chain polymers and, since an active OH group is left at each end of the chain, polymerisation continues and the chain increases in length. The hydrolysis of alkyl tricholorosilane RSiCl3 gives a very complex cross- linked polymer. 1. Silicones act as excellent insulators for electric motors and other appliances as they can withstand high temperatures. 2. Straight chain polymers of 20 to 500 units are used as silicone fluids. They are water repellent because of the organic side group. These polymers are used in waterproofing textiles, as lubricants and as polish. 3. Silicone rubber retain their elasticity even at low temperatures and resist chemical attack. They are mixed with paints to make them damp-resistant. 4. Silicone resins, a cross-linked polymer used as non-stick coating for pans and are used in paints and varnish. 5. Silicone oils are highly stable and non-volatile even on heating. Hence used for high temperature oil bath, high vacuum pump etc.